The most simple but fulfilling recipe I've made in a while is these Raisin Bread Crostini. Here's what you do. Grab fresh ripe fruit - I had saturn peaches and strawberries. You will need cream cheese and some bread - I had cinnamon raisin bread on hand but banana bread would be really good with this as well. Toast the bread up - it needs to have a nice crunch to it. 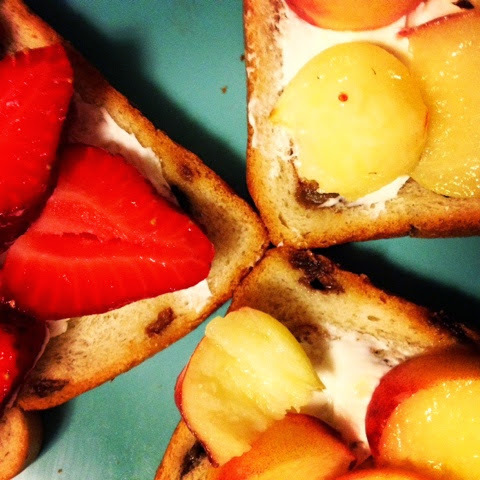 Smear a thin layer of cream cheese and place the sliced ripe fruit on top. Enjoy with a cold glass of tea, some shade and a smile.